Whilst tracking your weight may seem like an obvious measure of your progress when you set out on your weight loss journey, there are heaps of other things that count towards making progress. Yes, it’s ok to use weight as a guidance for monitoring progress, but it can actually be counterproductive and discouraging and here’s why. Weight is only part of the story and we shouldn’t obsess over whether the number we read on the scale has gone downwards or not. Your weight can fluctuate by several pounds and water retention alone can be the difference between an additional 3-5-pound weight gain;that’s just in the course of one day! Hydration levels, menstrual cycles, carbohydrate consumption, pre-and post-bowel movement can influence your weight, as can hormonal fluctuations and elevations in cortisol levels. You can look better and yet weigh the same! 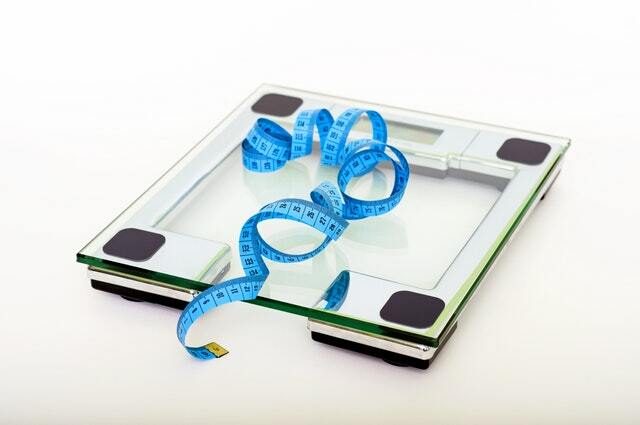 For example, if you gain 4 pounds of lean muscle and lose 4 pounds of body fat, the scales will suggest that you’ve achieved nothing! Muscle is denser than fat, therefore as you build and develop muscle, you might weigh the same as you always have, but your body becomes physically leaner. Your health and body weight are determined by your body composition (the proportion of fat, muscle, and bone of an individual’s body) and not just your weight. Learn to embrace muscle as you would a friend. Muscle boosts your metabolism which means a pound of muscle will burn more calories than a pound of fat. So even when you’re not exercising you will be burning more calories by just having more muscle mass. Weight doesn’t necessarily show health and relying on what a scale says to determine your health can actually be unhealthy. In fact, heavier individuals with a low body fat percentage tend to be healthier and to live longer than skinnier individuals with a higher body fat percentage. If it’s not just down to the scales, what are the go-to methods to assess/monitor progression?! * Take pictures…we now know the scale weight might not move, but when you look at progress pictures this is where you can see some vast improvements. Take pictures every 3-4 weeks from the side, back and front. Ideally in the same clothes and in the same lighting wherever possible. * Improved workout performance. We offer a series of tests https://lrgfitness.com/monitoring-success which will help you establish your progress. * How do your clothes fit? Does that pair of jeans feel as tight or that T-shirt hang better? * Ask yourself how you feel? Do you feel stronger, have more energy, performing better in your workouts or other activities? Are you finding daily chores easier? All of which cannot be answered by your scales in the bathroom. * Body image, how do you look in the mirror? Improved self-confidence? * Remember strength is an important aspect of fitness. If you focus on building strength, transforming your body will be a beneficial by-product. So, regardless of your body type, it’s important to get the adequate amount of exercise to stay healthy to help avoid long-term health problems. Aim to be consistent and constant with what you’re doing so it becomes routine and habitual. Above all, don’t give up. As no matter how much at times it might be a struggle, if you refuse to give in, success is inevitable.